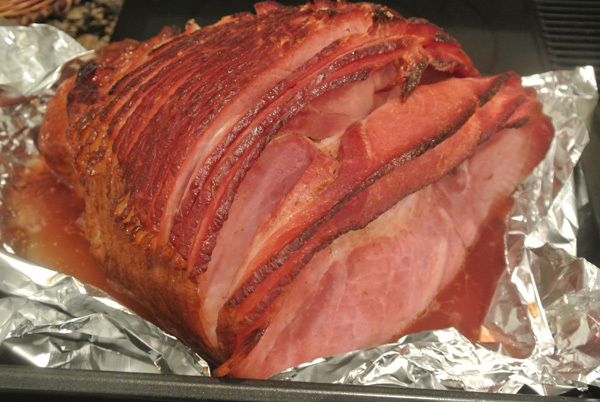 We always have ham on Christmas Eve, but rarely have it other times of the year. 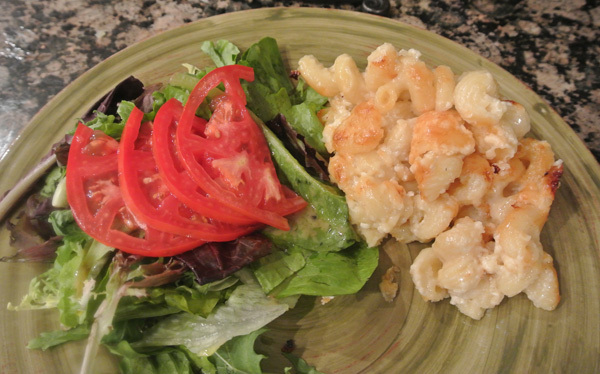 I found a Mac & Cheese recipe from plainchicken.com that I was dying to try and decided ham would make a great pairing for Take out Tuesday’s meal. I had to go to Costco anyway, where else can you buy Advil, wine, meat, printer ink, and tires? PERFECT. 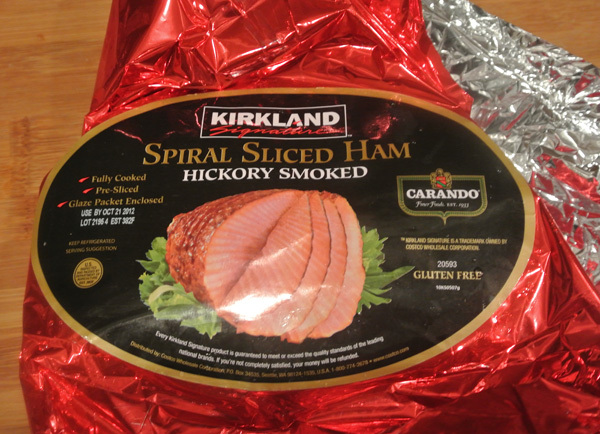 Costco carries this ham year round, so I grabbed one on my third trip. Yep, I went back 3 times. I am always preaching about time savers, I think because I waste so much. I went to Costco specifically to buy the ham and of course left without it. I got to my car and realized the wine I paid for was not in my cart. I went back to the receipt checker lady and she said, “oh yea, sorry, it got put in the wrong buggy, we are holding it for you.” Ok, phew, so I went on my merry way when an hour later I realized I forgot the ham, hence the third trip. The receipt checker lady just gave me the “what a Dumb Blonde!” look , but I finally got the ham!! 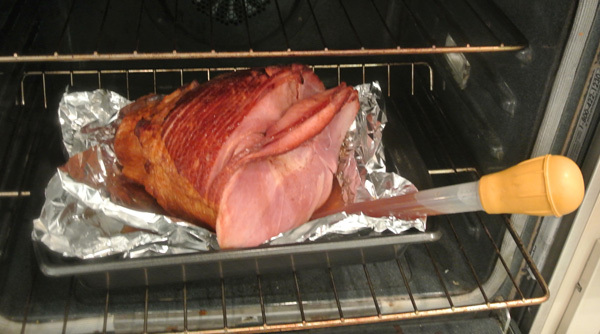 This ham comes with a glaze mix in the package, you just mix it with a little water and pour it over. I put it in a low oven for about 2 hours, just to impart a little flavor because it is already fully cooked. 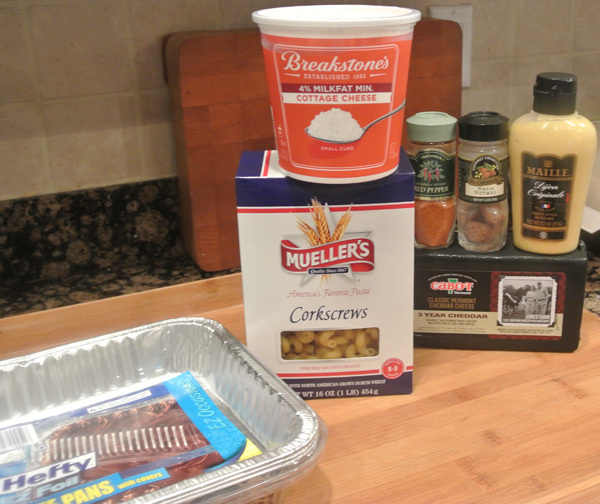 Now at Christmas time I go to more trouble, making my own glaze and putting the ham on the grill, but today I am going with FAST & EASY choices. This recipe is no boil, meaning you don’t have to cook the pasta first! What a time saver! [there I go again] See the cheese in the black wrapper? I got that at Costco too [on the first trip] and it is a favorite of mine. It is a white sharp Vermont Cheddar. I only need about half of it for the Mac & Cheese but I shredded the whole thing in the food processor and saved the grated cheese for future use. 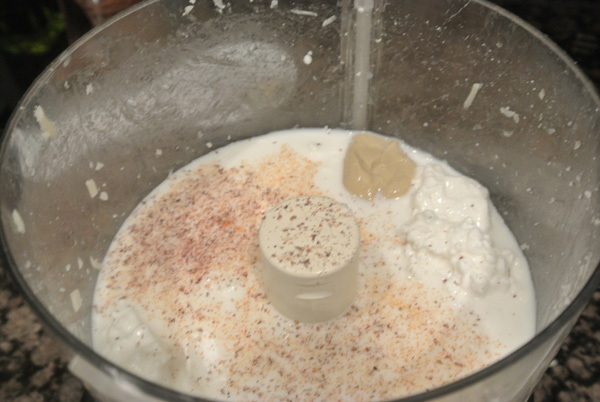 I love my food processor, but if I am going to get it dirty, I am going to do as many things as I can with it. This recipe needs milk too, I used 2%. 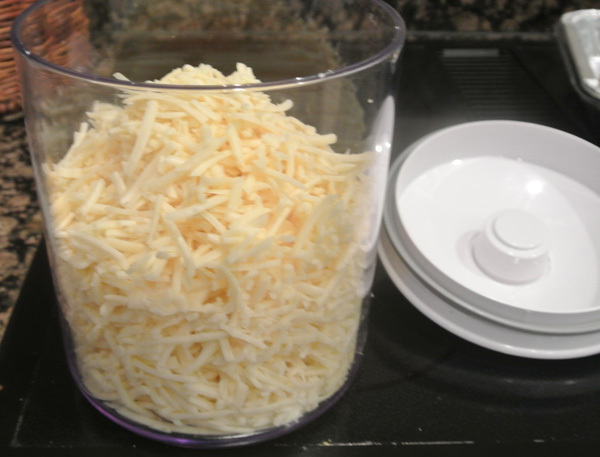 Pour the sauce in a large bowl and stir in 3/4 of the grated cheese. 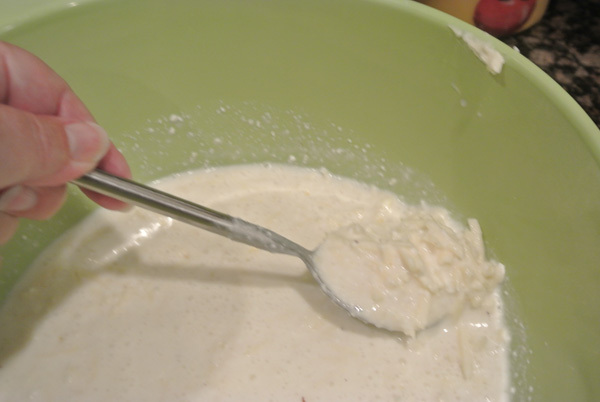 Then stir in the uncooked pasta and put the mixture in a baking dish sprayed with cooking oil. This recipe makes 8 servings which I divided into 2 pans, one for us and one for Hungry Husband Jr.’s family. Now cover tightly with foil and bake for 30 minutes at 375 or refrigerate for baking later. Ham’s done. I wrapped some slices for HHjr, reserved some for us, then divided the rest into smaller portions and froze for another time. If I was very Julia Child/Martha Stewart like I would make some kind of marvelous soup or French “cassoulet” with the ham bone, but I’m not so I didn’t. 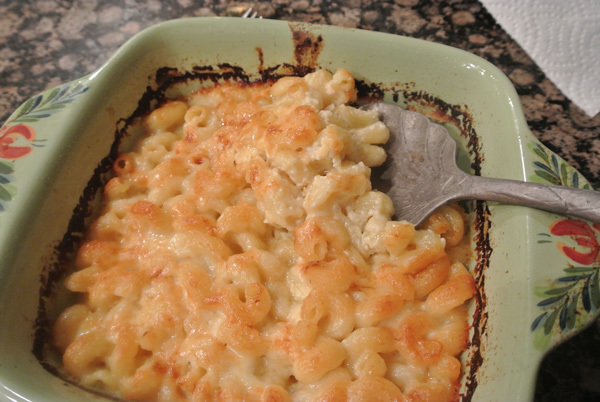 Finished Mac & Cheese. I can’t tell you how good this is! 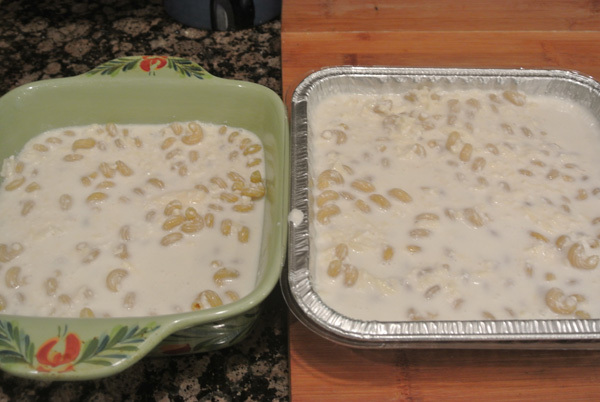 The cottage cheese imparts a sort of tangy flavor, but you would never guess it was in there. I wish I could take credit for this dish, but all I did was modify it just a little. So good and so easy. Don’t fool yourself thinking that because there is cottage cheese in this dish that it is diet food, because it’s not! There is a LOT of regular cheese in this dish too! But with a smallish serving and big green salad you won’t feel so guilty! Hungry Husband also got a big pile of ham and a couple of biscuits. note: I did not add any salt because the cheese is very salty anyway. I also didn’t add additional black pepper because of my grandson, Super Boy. Feel free to spice it up anyway you like. The cottage cheese and sharp cheddar together really give it a zing anyway. Jenna, I can’t tell you how much I’m enjoying your recipes and gift ideas! I feel like I’m right there with you! 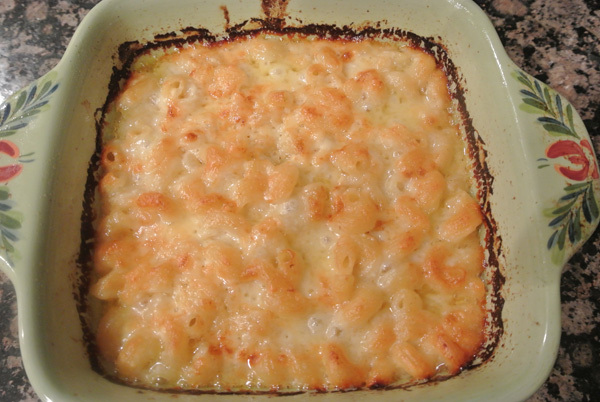 And this mac and cheese recipe will be a great one for me to take to church on Sunday nights. I like ‘easy’!